We try to portray it as a blending of responsibilities and job functions, especially when we’re trying to sell a product to two customer bases simultaneously: DevOps, the merger of development and automation. Yet there are too many technologies intentionally developed to bolster the layers of abstraction between applications and networks. Originally, those layers were supposed to free the applications developer, way up on Layer 7 of the OSI stack, from having to mess about with all the dirty, infrastructural affairs of Layer 2 or 3. With containerization hoisting both portable deployment and distributed systems into the same spotlight, the result may be a clash of mindsets. On one side of the stage is the argument that serverless development, where the developer never sees or cares about the underlying infrastructure, is truly cloud-native. Making room for itself on the same side of the stage is the equally valid argument that you can’t secure a network you don’t understand. And if a distributed systems application is, as they say, a network, that’s a problem. MacVittie’s discussion with us came by way of F5’s introduction Friday of a component called Container Connector, to a system it started building last November for integrating microservices with existing networks. That system began with Application Connector, a component which links cloud-based applications to F5’s Big-IP application delivery controller. The purpose there is to enable security and firewall policies that also govern access to an application on-premises, to one that’s deployed on a cloud platform, including the public cloud. Container Connector, announced at the same time but generally released Friday, extends that same premise to microservices. It creates a proxy checkpoint that represents the entire microservices conglomerate as a single entity, for any service or other application attempting to communicate with it. This way, traffic may be monitored and governed in real-time, and scalability can take place in a manner that’s more sensitive to what the incoming requests are, as well as how many. Rather than attempt to usurp Kubernetes or Mesos, the BIG-IP system works with orchestrators and schedulers. Believe it or not, MacVittie said to my astonishment, many phone and tablet apps today actually delegate the logic for which IP address to which it addresses its requests, to the client-side app. Your phone may be making decisions about which IP to talk to, based on its assessment of traffic. If you’ve ever waited in line in a post office along with dozens of people and six active clerks, you know that the length of each line is never a good indicator about the time you may spend there. Imagine a phone app making a similar decision, given a half-dozen or so IP addresses, about which one is most responsive. Some developers would say, all things being random, that this scheme would resolve the whole load balancing issue. But what it’s really done is shove the issue to the client side, making the app entirely responsible for the traffic patterns that emerge. What’s more, MacVittie told me, app developers try to resolve this issue by creating a kind of external registry — literally, another service that informs them when a queue is backed up, or another one is clearing up. This is perhaps the ultimate example of the wrong way to mash up dev with ops. It also illustrates the value of that layer of abstraction — the notion that how an application works should be one or more steps removed from how an application is made to work. MacVittie explains that Container Connector monitors an active server cluster for signs that it’s being scaled, and for when new instances come online. CC then informs F5’s Big-IP controller, so that it may respond by registering new instances (or removing old and disused ones) from a pool of addresses to which security policies apply. An application services proxy — another component in the scheme — manages network routing between and to instances. That particular proxy makes it feasible, for example, for instantiated containers that are not actually being used to be more readily removed from the pool. More broadly put, the Big-IP system is doing the ops part of the job. And as MacVittie unhesitatingly admitted, it’s the system operator who’s better equipped to handle this job. There are pre-defined templates to help resolve issues about how to respond to orchestrator- or scheduler-triggered events. One such template, for example, may spin up HTTP 1.1 connections for internal-only services, while building HTTP/2 connections for public-facing gateways. Others set up basic web application firewall (WAF) policies that send up flags for cross-site scripting (XSS) events, or SQL injection attempts. Another can scrub outgoing data for the appearance of possible credit card numbers or Social Security numbers. F5’s value proposition is based on a very hands-on approach to managing the virtual network and maintaining its connections with the physical one. VMware has been consistently making the case that maintaining the network security foundation it established between the hypervisor and the processor is critical for building new applications going forward, even when not all those applications will need the hypervisor. It’s why many enterprises are sticking with the virtualization layer they have, rather than fly to others they know not of. F5’s counter-argument seems to be the new distributed systems architecture demands a new approach to networking security that’s at least equally effective as the old approach, if not more so. And that the obscure, strange indeterminacy of microservices architecture will not serve as its security blanket for very long. IBM would be among the first companies to back up F5’s argument. F5’s Lori MacVittie is not unaware of the business factors that make, for example, Docker Inc.’s new push for one-button monolith containerization, so very attractive to CIOs. “As a very young developer,” she told The New Stack, “I was always wholly frustrated by the refusal of the large enterprises I worked for to re-architect and modernize. ‘Why do we have all this stuff? This is ridiculous!’ Over time, I learned there are business reasons and financial reasons, and the costs to actually re-architect can be so overwhelming that it’s just not going to happen. The return on investment never pays off. She cited a case study where a bank in Australia took the plunge, with a full re-architecture of its old mainframe-based business logic, at a cost that eventually tripped three-quarters of a billion dollars. “The notion that you can take an application, wrap it in a Docker container, and then get a performance boost as well as more frictionless scale by simply launching multiple containers, putting a proxy in front, and letting it scale up and down as needed, is probably very attractive to a lot of organizations,” she continued, noting surveys that indicate enterprises are attracted to the instant portability this method provides, letting them “lift and ship” their applications into the public cloud. And then she admitted that some of this turnkey functionality may yet be incorporated into a system like F5’s Big-IP. It will be the merger of mindsets after all — just not the two we thought. 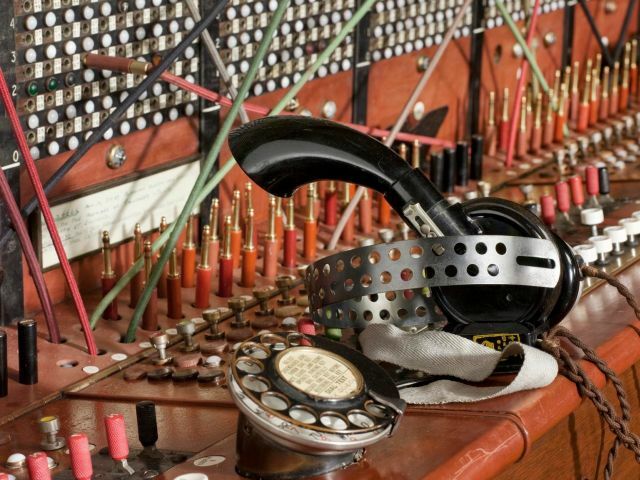 Title image of a vintage British telephone exchange switchboard circa 1925-1960 from the British Science Museum, licensed under Creative Commons 4.0.